Information on shipping, delivery, returns, exchanges and refunds can be found below. 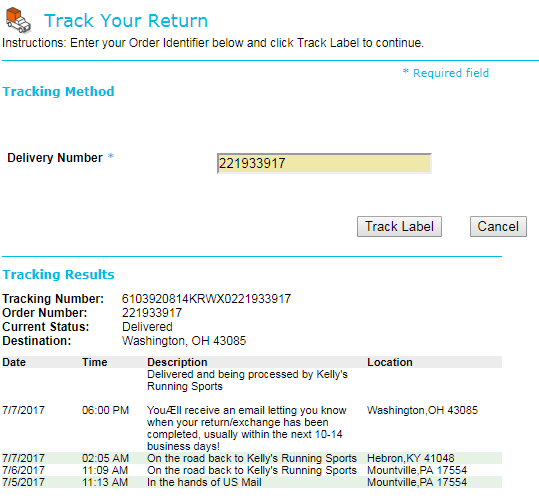 If you have further questions, don't hesitate to email info@kellysrunningwarehouse or call us at (800) 421-0551. You'll be glad to know that your Kelly's Running Warehouse order ships for FREE anywhere in the continental United States, with no minimum purchase required. Your free standard shipping will be automatically reflected in the shopping cart. All in-stock items usually ship from our warehouse within 24 hours and arrive in 2-3 business days. If any of your items have a pre-order or backorder status, you will be notified. If you need your order faster, we offer Next-Day Air service for $20. For Next-Day Air delivery to a PO Box or APO/FPO address, please allow an additional day for delivery. Kelly's Running Warehouse only ships to addresses within the United States. *Bulky items such as fitness equipment are excluded from free shipping. Items in new, unworn condition can be returned up to 30 days from the original purchase date. A refund will be credited back to your original payment source minus any shipping charges which are non-refundable. You can send your items back to us with the pre-paid SmartLabel that came on the order invoice in your original package or the shipping service of your choice. If you use the pre-paid SmartLabel, a flat $9.99 fee will be deducted from your refund total. If you need to print a new SmartLabel, follow the directions here. Please allow 2-4 weeks for the entire returns process to be completed. Now that you've decided to make a return, here's how you do it. Fill out the return form on the back of the invoice included in your original shipment or print another one here. Pack the items you want to return along with your return form in secure packaging. Attach the pre-paid SmartLabel or your own shipping label to the package and drop it off at the shipping carrier. SmartLabel packages should be dropped at a US Post Office. In the case that your order did not come with a SmartLabel on the invoice or you no longer have it, you can print a label yourself using the directions below. Please keep in mind that $9.99 will be deducted from your return total if you ship your return with the SmartLabel you create. Enter your Delivery Number. 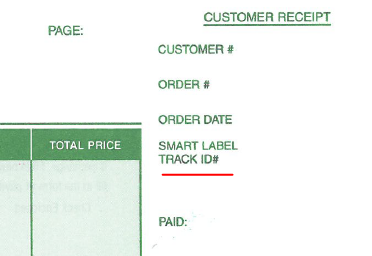 Your delivery number can be found on your original invoice under Smart Label Track ID# and is usually a 9-digit number starting with 22xxxxxx. Confirm your shipper information and click 'Next'. Click 'Generate Label' and print the label. Attach the label to your return package and drop it with the US Postal Office. Once your SmartLabel return package is dropped off at the US Postal Office, you should be able to begin tracking its progress back to us within a few hours. Visit the Track Your Return page.